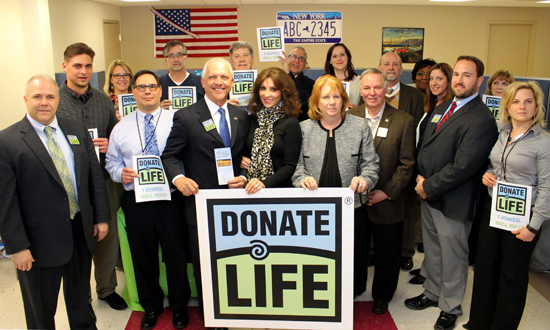 Surrounded by roughly two-dozen county leaders who agreed to be organ donors, Niagara County Clerk Joseph A. Jastrzemski added his name to the New York State Donate Life Registry at the Lockport Department of Motor Vehicles Tuesday. Joining Jastrzemski were a collection of county government department heads and other top leaders, as well as new County Manager Richard E. Updegrove and county lawmakers Tony Nemi, R-Lockport, and Richard L. Andres, R-North Tonawanda. All were on-hand to ensure they, too, were listed in the state donor registry. The group had assembled at the DMV because Jastrzemski spent the past weekend reaching out to local elected and appointed officials, asking them to “lead by example” and help reverse New York state’s second-worst-in-the-nation organ donor status. 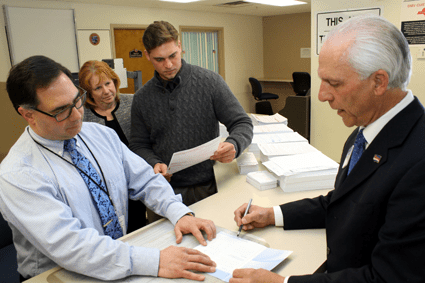 Jastrzemski, who heads up the county’s motor vehicle departments, said information provided to him by Unyts and the New York State Association of Counties that showed just 18 percent of New Yorkers had joined the registry convinced him leadership is needed on the issue. Jastrzemski said motorists coming in to renew their driver licenses who elect to join the donor database have a “heart” symbol added to the front of their license, identifying them as a donor. “It’s important that donors are identified quickly, so that organs can reach people who desperately need them,” Jastrzemski said. He was joined by Jeremy Morlock, the manager of community engagement for Unyts, who provided additional statistics. Morlock said more than 121,000 individuals are currently awaiting transplants across the nation, with 10 percent of them in New York. “We’re asking our neighbors to join us and help save lives,” Jastrzemski said. With this year’s tax deadline looming and April marking National Financial Literacy Month, Attorney General Eric T. Schneiderman offered New Yorkers tips to avoid falling victim to reported tax season scams. The attorney general also asked taxpayers to notify his office of any suspected fraudulent schemes designed to steal personal and financial information from consumers. Legitimate government agencies will never insist consumers pay a debt only via a pre-paid credit card. It’s a matter of minutes. So said the Lewiston Town Board, with regard to the time frame allotted to public comments. And some residents attending Monday’s meeting weren’t exactly too thrilled about it. At Town of Lewiston meetings, as in most government sessions, residents are provided a certain time frame to express their comments on town/government affairs. Most provide for a limited time at the beginning of a meeting, some allow for timed comments at both the beginning and the end, while still others allow for a much more open-ended comment period. That statement was met with applause. “The purpose of (a) resident’s statement during a Lewiston meeting is for the Town Board to hear the thoughts of the people they serve. 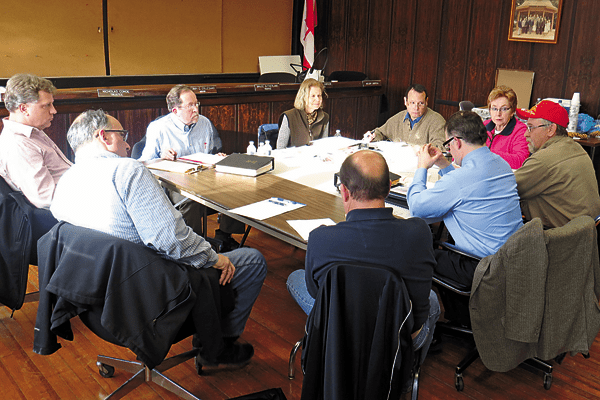 It should be a time where Town Board members receive input and ideas. “Sadly, what has evolved are Town Board members who have demonstrated they care little about what the residents say and more about how long they say it, as was demonstrated by Mr. Broderick stopping a resident’s remarks because they ran out of time. The people suspect something isn’t right when free discussion is feared by the government. The Village of Lewiston Historic Preservation Commission/Planning Board met Thursday with Department of Public Works Superintendent Terry Brolinski, Engineer Mike Marino, Building Inspector Ken Candella and Lewiston No. 1 Volunteer Fire Co. director Barry Beebe to confirm the required variances for Ellicott Development’s Center/North Eighth/Onondaga streets plaza proposal and James Jerge’s Onondaga Street apartment complex/Fairchild Place lots. “The purpose of today’s meeting was to solidify the variances that we feel will be needed by the Planning Board in order to allow these projects to go forward as they’re currently planned,” Chairman Norm Machelor said. In his memo, Beebe, who’s also a senior designer with Lewiston’s Advanced Design Group engineers, listed internal traffic flow, building access, potable water, off-site traffic, snow removal and drainage/sewer as concerns surrounding the “Paladino plaza,” so-called after Ellicott’s CEO, William, who first presented the project plan.